All LPG powered vehicles require an LPG certificate every 12 months. Dunedin South, Dunedin Central, Forbury, St Clair, St Kilda, Kew, Corstorphine, Caversham, Lookout Point, Calton Hill, The Glen, The Oval Area, Mornington, Kenmure, Roslyn, Andersons Bay, Musselburgh, Waverley, Concord, Green Island, Abbotsford, Fairfield, Kaikorai Valley, Otago Peninsula. Complete Auto Repairs is conveniently located at the southern end of Hillside Road. Michael Partel and Erin Hawkins purchased this extremely successful business on 1 April 2016 and have never looked back. This well-equipped workshop has established a reputation of providing the highest level of mechanical service to their extensive old and new client base. Michael started work as an apprentice technician in Dunedin 32 years ago and has continued to work in this field ever since, setting up and running many Dunedin workshops, in Mechanical, Forman and most recently Management roles. He is also one of the very few fully qualified Alternative Fuel specialists in Dunedin. 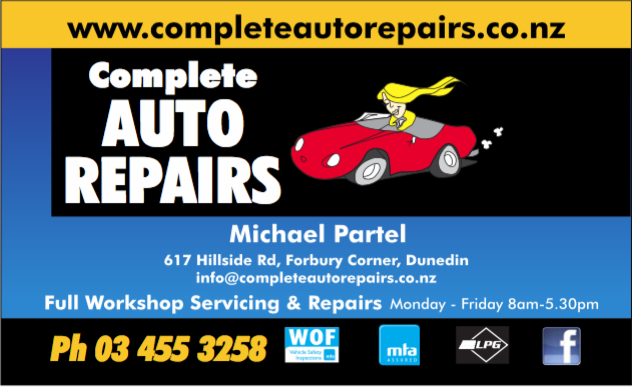 © 2014 Complete Auto Repairs, Dunedin. All rights reserved.